It's time to talk about something dear and personal to us: poetry. Based on majority votes last month, we are going to discuss poetry books written by local and foreign authors. Some poems are powerful, emotional and able to move us in an unimaginable way. We will not limit the languages, and you are welcome to read a short poem (not more than 3 minutes) that you select from a book or wrote by yourself. 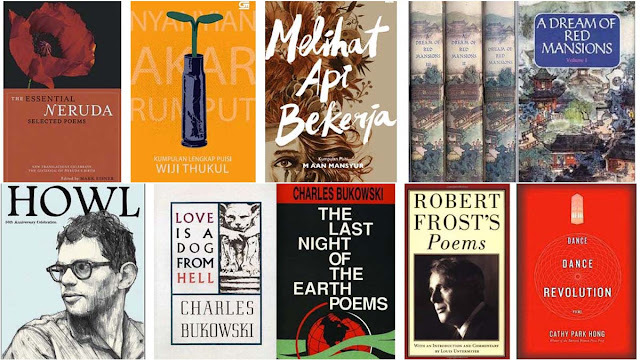 Expect to hear review on books like "The Essential Neruda: Selected Poems by Pablo Neruda" translated by City Lights Books, "Nyanyian Akar Rumput: Kumpulan Lengkap Puisi Wiji Thukul" (A Complete Collection of Poems written by Wiji Thukul),"Melihat Api Bekerja: Kumpulan Puisi M. Aan Mansyur" (Looking at the Working Fire) - an earlier work of Indonesia's promising young poet Aan Mansyur, "A Dream of Red Mansions" classics written by Cao Xueqin, "Howl and Other Poems" written by Allen Ginsberg, "Love is a Dog from Hell" and "The Last Night of the Earth Poems" written by Charles Bukowski, "Robert Frost's Poems" written by Robert Frost, "Dance Dance Revolution"written by Cathy Park Hong, and more.